2 Bedroom Flat For Sale in Derby for Asking Price £150,000. Calling All First Time Buyers And Investors!! 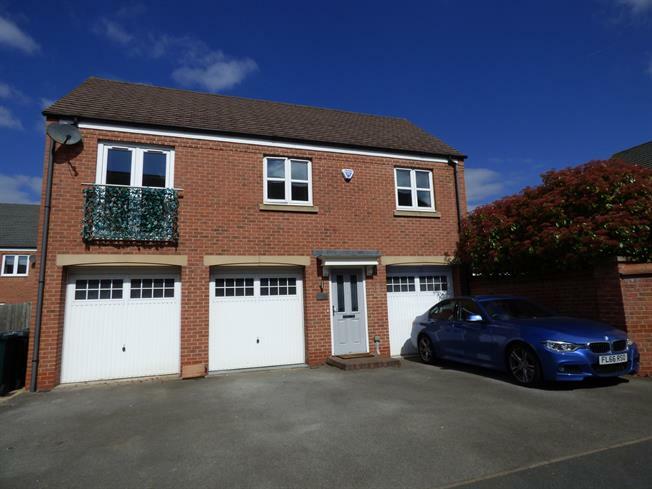 Well presented two double bedroom coach house with a single garage and off road parking. The Accommodation briefly comprises of entrance hall with stairs to the first floor, landing, open plan lounge/kitchen with a Juliet balcony, two double bedrooms and bathroom. To the front of the property there are two parking spaces with an integral single garage with power and lighting. Wooden door to the front, stairs to the first floor, radiator. Double glazed window to the rear, built in storage cupboard, radiator. Kitchen Area- A range of wall and base units with rolled edge work surface, one and a half bowl sink and drainer, electric oven, ceramic hob with over head extractor, space for free standing fridge/freezer, plumbing for washing machine and space for dish washer, recessed lighting. Lounge Area- Juliet balcony with French patio doors, television point, radiator. Double glazed uPVC window facing the front, radiator, fitted wardrobes. Double glazed uPVC window facing the front, radiator, built-in wardrobe. Low level WC, panelled bath with shower over the bath, pedestal sink, double glazed uPVC window facing the rear, radiator, tiled flooring, shaving point. Up and over door to the front, power and lighting, water supply, under stairs storage. To the front of the property is off road parking for two cars.